In April 1915, the government of Ottoman Turkey began the wholesale deportations of its Armenian population. A group of women and children, of the 2 million Armenians, being deported under guard. A caravan of mostly women deportees walking on the open road headed toward the Syrian Desert. Armenian men in the town of Kharpert being deported by guards with fixed bayonets headed toward their execution. The first acts of the Armenian Genocide included the execution of religious and political leaders of the Armenian community. Mass hanging of Armenians in the capital city of Istanbul. Indiscriminate massacres regularly interrupted the deportation process. The deportations were designed to result in large-scale deaths by facilitating massacre. Besides the mass slaughter at killing sites, numerous victims were murdered individually. Individual murders typically occurred in order to rob victims of their possession. Children were not spared any of the abuses inflicted upon the adult Armenian population. Along the deportation routes and at their destinations in the Syrian Desert, Armenians were herded into concentration camps. A deportee camp site constructed of makeshift tents by survivors. Tens of thousands of deportees were forcibly relocated into unsanitary concentration camps in remote areas. A tent city created by deportees on the outskirts of the town of Konya in central Anatolia. Without food, water, or shelter, countless Armenians died of exposure and starvation. Children emaciated by starvation ended up living naked in the streets. A child in an advanced stage of starvation. An expiring child covered by flies. Starving children living in the open. An estimated 1.5 million Armenians perished between 1915 and 1923. 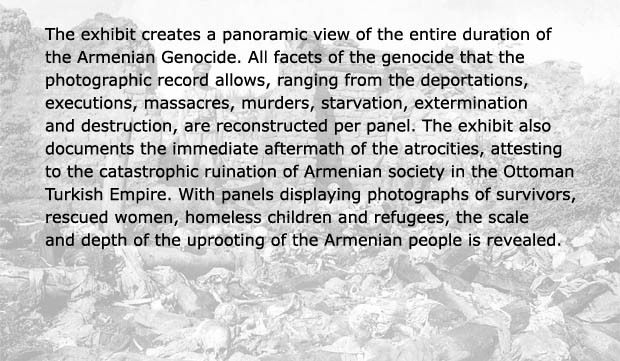 The perpetrators aimed at the annihilation of Armenians of all ages. A site of mass extermination of youngsters. To complete the eradication of the Armenian people from their homeland, their homes were destroyed too. Armenian churches, schools, and towns were systematically destroyed. Churches were desecrated and deliberately vandalized. Countless Armenian historic monuments were dismantled or dynamited. Homeless children were left wearing rags as their only clothing. Young boys in rags with head wounds. With the vast majority of adults killed or starved to death, survivors of the atrocities were mostly children. Many young women were abducted during the Armenian Genocide. Some were forcibly converted to Islam. To prevent their escape and impede their identification, many of the captive women were tattooed. The rescue of the captive women became a priority for survivors. A tattooed Armenian rescued from captivity. Rescued women were reintegrated back into Armenian society to restore their dignity. Many children were left without families to care for them. Without the familiarity of a community, children were on their own. A refugee child in a moment of contemplation. Bare feet, in rags, and no school to attend. Thousands of Armenian children were homeless. Any type of shelter, including caves, was preferable to sleeping in the open. A refugee child in layers of rags for protection from the cold. The survivors of the Armenian Genocide were denied the right to return to their former homes. The survivors gathered in refugee camps spread across the Middle East. Impoverished refugees converted sheepfolds and cow pens into temporary homes. Survivors formed exile communities by building temporary churches and schools. An Armenian refugee camp in Beirut, Lebanon, consisting of hastily constructed wooden shacks. An Armenian refugee camp in Aleppo, Syria. The refugee camps turned into permanent settlements for deported Armenians. Relief efforts focused on addressing the housing needs of orphaned children. The largest relief undertaking was organized by Near East Relief, a New York charity. Children received new clothing and were restored to health by relief agencies. Besides a meal and an education, Near East Relief also provided employment training for young boys to build new lives. Between the years 1915 and 1923, the vast majority of the 2.1 million Armenians living in Ottoman Turkey were uprooted from their homes through a deliberate policy conceived by the Ottoman government and implemented by its administrative machinery, including the army, police, post, interior ministry, rail system, and special agencies created for the express purpose of deporting, robbing, and slaughtering the Armenian population. The Armenian Genocide started in the thick of World War I but continued after the war ended in 1918. It continued even after the international treaties designed to bring peace to the world and to bring to justice those responsible for war crimes were signed in Versailles in 1919 and in Sèvres in 1920. By 1923, by the hardships and brutalities associated with the deportations, the continuous massacres, the epidemics that raged in the concentration camp sites that lacked all sanitation, and by the pangs of thirst and starvation, 1.5 million Armenians had been killed. Jesse Jackson, the American Consul in Aleppo, observed the entire process of deportation as hundreds of thousands were routed through Aleppo on their way from the fertile valleys of Armenia and the commercial centers of Anatolia to the parched wastes of the Syrian Desert. As early as June 5, 1915, he reported: "it is without doubt a carefully planned scheme to thoroughly extinguish the Armenian race." On the basis of this and additional cables from other American consuls, Henry Morgenthau, U.S. Ambassador to the Ottoman Empire, informed the American government on July 16, 1915, that "from harrowing reports of eye witnesses it appears that a campaign of race extermination is in progress." The Armenian Genocide was perpetrated by the Committee of Union and Progress, the radical wing of the Young Turk party that seized power in the Ottoman Empire. In their zeal to create a homogeneous society exclusively Turkish and Muslim, the Young Turk radicals sought to exclude the Christian populations that had long inhabited Asia Minor. Through expulsions, expropriations, and extermination, by 1923 no Christians to speak of, including Assyrians and Greeks, remained across Anatolian Turkey. The campaign was chronicled in the archives of the United States, Great Britain, France, Germany, Russia, the Vatican, and the Ottoman Empire. Writing in 1918, former president of the United States Theodore Roosevelt, described the Armenian massacres as "the greatest crime of the war." As early as May 24, 1915, the Allied Powers, England, France, and Russia, then at war against the Central Powers, Germany, Austria-Hungary, and Turkey, had condemned the massacres as 'crimes against humanity and civilization.' And when in 1919 President Woodrow Wilson sent Major General James Harbord on a military mission to investigate conditions in the Near East, Harbord reported back that "the traveler in that region is seldom free from the evidence of this most colossal crime of all ages." Reflecting on the consequences of the Great War in his 1929 book titled The World Crisis, the future British Prime Minister, Winston Churchill, wrote: "In 1915 the Turkish government began and ruthlessly carried out the infamous general massacre and deportation of Armenians of Asia Minor." He added: "There is no reasonable doubt that this crime was planned and executed for political reasons." Summing up what transpired in Armenia in 1915, he explained that "whole districts [were] blotted out in one administrative holocaust." Churchill, Roosevelt, Harbord, Morgenthau and Jackson all described in disbelief the scale of the crimes committed in 1915. Morgenthau went so far as to say: "I am confident that the whole history of the human race contains no such horrible episode as this. The great massacres and persecutions of the past seem almost insignificant compared to the sufferings of the Armenian race in 1915." Churchill, however, had hit upon a word that would echo across the 20th century as governments planned and implemented ever greater crimes against humanity, many with complete impunity. In 1944, Raphael Lemkin called them genocide.